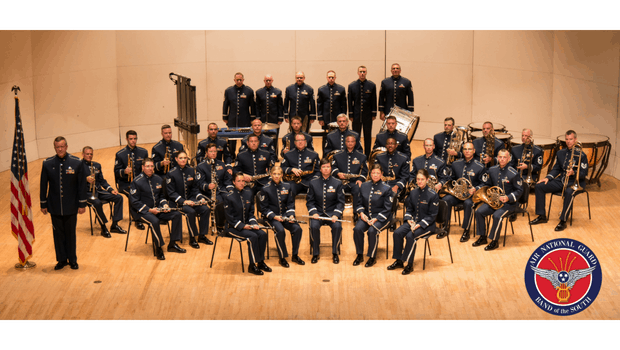 The Air National Guard Band of the South will perform a free concert at Florida Southern College in Branscomb Auditorium on Thursday, June 28, 2018 at 7:30pm. The Air National Guard Band of the South supports the total Air Force and Air National Guard mission in war and peace by inspiring patriotism and fostering a deep appreciation of the rich history and legacy of the Air Force. This is accomplished, mainly, through professional performances by some of the nation’s best musicians. The Band of the South’s mission is two-fold: first, to enhance and lift the morale and espirit de corps of our fellow Airmen stationed either in the United States or abroad; second, to increase the public’s understanding of the importance of air power, the missions and programs of the Air Force and Air National Guard and the bravery, sacrifice and dedication of Airmen across the globe. While performing these missions, members of the Band of the South have performed in almost every state in the union as well as being deployed to Germany, Kandahar, Afghanistan and more. The Air National Guard Band of the South is stationed at McGhee Tyson Air National Guard Base in Knoxville, TN. This event will feature patriotic and popular music of Count Basie, Duke Ellington and Stars & Stripes Forever. Branscomb Auditorium is located within the Robert Davis Performing Arts Center at 1085 Johnson Ave. Lakeland, FL 33801 on the beautiful campus of Florida Southern College. For more information, please call 863-680-4295.